For those willing to give up their whammy bar ways, Jon Bondy’s fixed bridge replacement for Trans-Trem, S-Trem and R-trem guitar bridges is worth a look. First covered in Headless Guitar Bridge by Jon Bondy, we now follow up with owner David’s excellent feedback on his experiences with this solution on his Klein electric guitar. 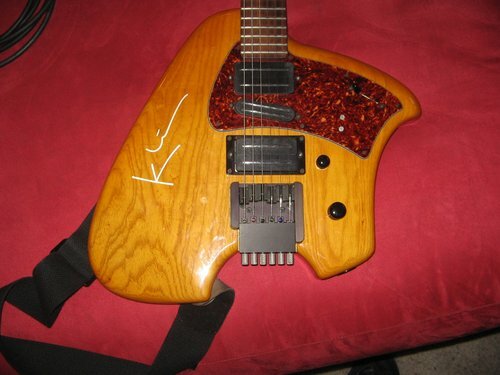 With the use of heavy strings, David found that his Klein guitar’s Trans-Trem would not float properly and ended up using it as a fixed bridge. This opened up the opportunity for the Trans-Trem to be swapped out with a bridge specifically designed for fixed use. I was happy to pursue this with Jon because his design would satisfy my most basic requirements. I could get a bridge and a spare, never have to search for Trans-Trem parts ever again, and not have to alter my Klein in any way. That’s all I was originally hoping to get out of this. The bridge is machined from aluminum and David guesses that it’s probably about 10 oz lighter – a significant weight savings for those looking to keep instruments as light weight as possible for ergonomic reasons. The tuning stability is top notch, it never slips. I thought my TT was stable but again, this is different. Perhaps this is due to my TT having 10 years on it, but still, a nice change. I also found the solid (non brass roller) saddles much easier to intonate. 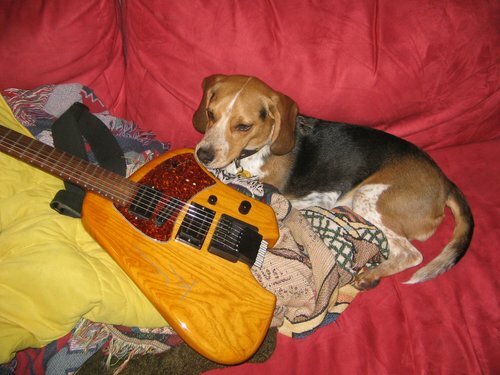 Many thanks to David for his thoughtful feedback and his attack beagle for watching over the Klein-Bondy guitar. I have Jon’s bridge on one of my Kleins currently and I agree with everything that David has said in this review. 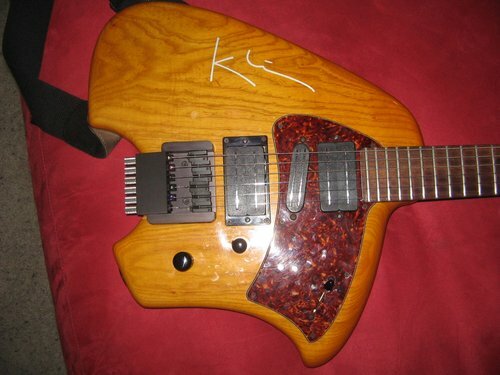 That’s a pretty swamp ash Klein David!